Well, we’re very lucky to have a special project from an overseas guest designer from across the pond! Mindy Ayers is the Marketing Specialist from Core’dinations, and in return for giving us here all their fabulous Core’dinations sandable-core paper, I sent Mindy one of our Ultimate Tools and told her to put it through it’s paces – here’s the fantastic project she came up with! Hi! I’m Mindy Ayers and I’m the Marketing Specialist for Core’dinations ColorCore Cardstock. I have been scrapbooking for over 15 years, so working in this amazing industry is a perfect fit for me. I am also lucky enough to work with many different paper crafting products along with Core’dinations. 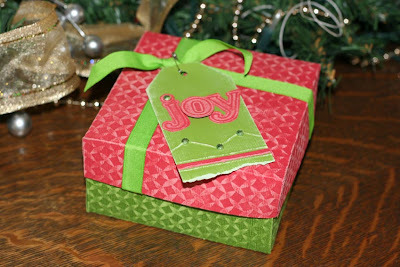 Check out the handmade gift box that I made with The Ultimate Crafter’s Companion. This was a fun and easy project to complete. 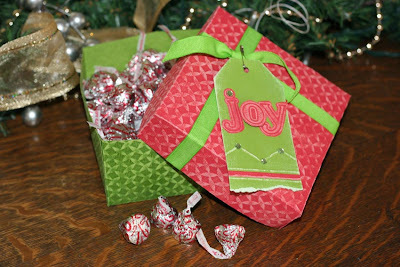 I made the box out of red and green papers from the Core Impressions Jenni Bowlin Vintage Brights collection. Notice how I sanded the pre-embossed pattern to reveal the lighter core color of the cardstock. 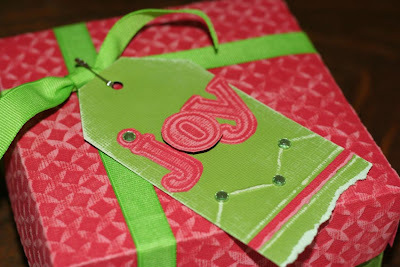 For the tag, again used the same collection to cut out the letters “JOY” but added some details to the tag itself. The Ultimate Tool has a lot of fun scoring lines that you can use for borders, journal lines and accents. After I scored my lines, I sanded the raised portion so the lighter shade shines through. A perfect handmade touch for a holiday gift!